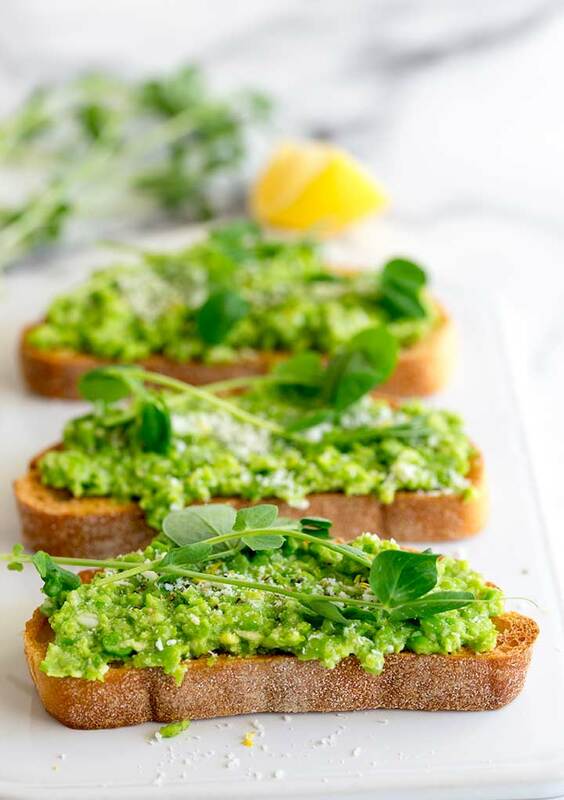 These simple Pea Bruschetta (pea crostini) make the most wonderful fresh easy appetizer. 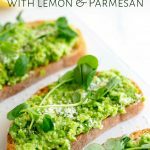 The ciabatta toast is spread with delicious pea pesto then drizzled with extra virgin olive oil and garnished with a little cheese and some lemon zest. For a boost to the fresh Spring flavors, you can add fresh pea shoots if they are available. Great for a date night appetizer or a light lunch. 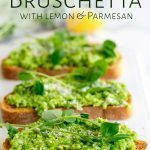 Although I find that these pea bruschetta are a little easier than the traditional tomato bruschetta, as the peas are smashed together into a pesto style spread. What is the difference between Bruschetta and Crostini? Bruschetta are bigger than crostini. Traditionally bruschetta is made from slices of a rustic bread like ciabatta whereas crostini is made from a smaller thinner finer bread, similar to a french stick. Both work here, the choice is yours. 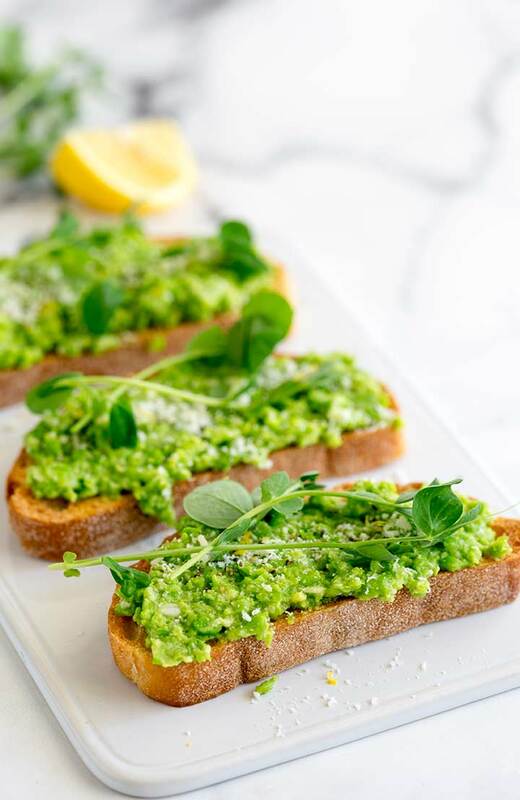 Although, if you are serving these as a quick nibble over some drinks with friends then you might want to go the pea crostini route. They are a little easier to eat. But for a light lunch then the more rustic pea bruschetta looks substantial on the plate. 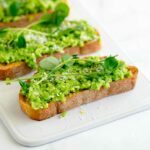 These pea bruschetta start with an easy pea pesto, I added a handful of pea shoots to my pesto as they are packed full of pea flavor and also super nutritious!!! But if you can’t find them, then leave them out and this will still be delicious! As I am making bruschetta I opted for my favorite ciabatta bread and cut it into perfect slices. For me, the perfect slice for bruschetta is thick enough that it will hold up to the toppings but thin enough that you can bite through it easily – about the thickness of your little finger! (0.5″ or 1.25cm) But please don’t get a ruler out, I don’t want to add stress to your kitchen. A little more or a little less isn’t going to hurt, this is just lunch. The bread gets drizzled with olive oil and then toasted under the broiler/grill until it is golden brown on both sides. This takes around 3 minutes on my grill, but grills are notoriously different so keep a watch on your bread. Take a cut clove of garlic and rub it lightly onto the toasted bread. The rough texture will act as a mini grater, extracted a little garlic flavor onto the bread without overpowering anything. Fresh bright peas are a wonderful vegetable to pair with wine but the addition of the lemon to dishes often makes it harder to match a wine. Here though the lemon juice is mellowed by the parmesan, meaning we can opt for something young and dry without fear of mellowing out the acidity too much. I would choose a bright Sauvignon Blanc or if you can find it an Austrian Grüner Veltliner would be a welcome choice. 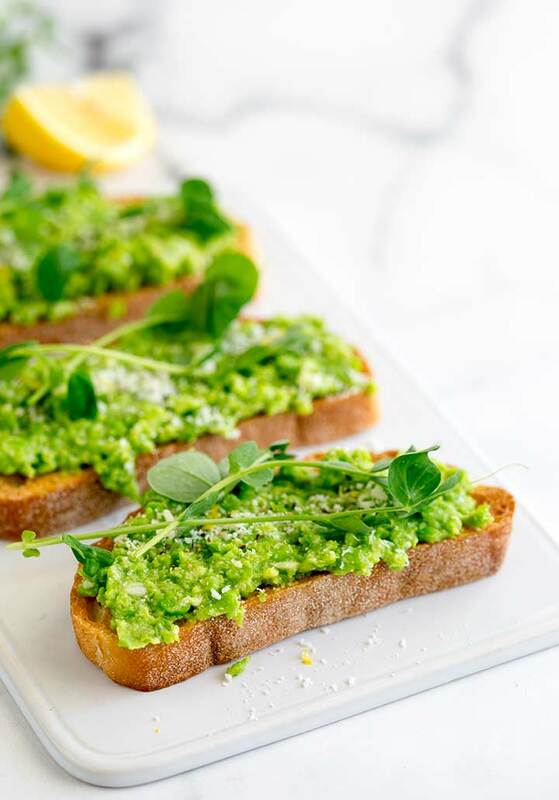 Pin this recipe for Pea Bruschetta. Pin it here. 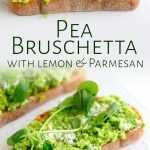 These simple Pea Bruschetta (pea crostini) make the most wonderful fresh easy appetizer. 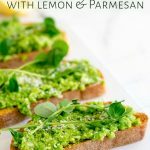 The ciabatta toast is spread with delicious pea pesto then drizzled with extra virgin olive oil and garnished with a little cheese and some lemon zest. For a boost to the fresh Spring flavors, you can add fresh pea shoots if they are available. Great for a date night appetizer or a light lunch. Place the ingredients in a food processor and use the pulse button to chop and combine them until you have a rough paste. Set aside until the toast is cooked. Pre-heat your broiler or grill. Drizzle the bread slices with the olive oil. Toast for 2-3 minutes a side until crisp and golden brown. Whilst the toast is still warm, use the half garlic clove to lightly rub the rough bread. 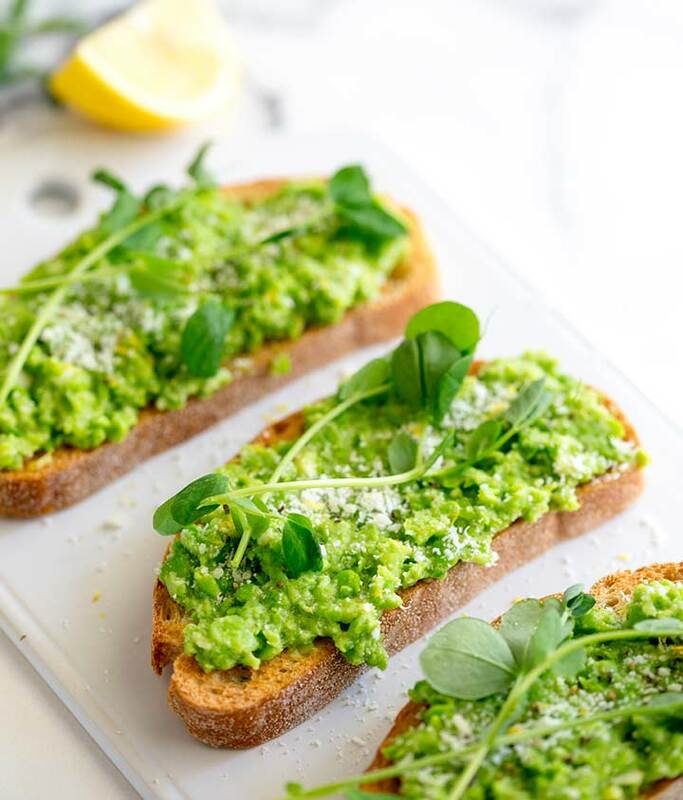 Spread the pea topping over the 6 slices of toast. Add extra parmesan and lemon zest to each bruschetta then top with additional pea shoots. Drizzle with extra virgin olive oil and garnish with black pepper. Remove the peas from the freezer for 15 minutes before making the pesto. Blanch the frozen peas in boiling water for 60 seconds.